Family photos can sometimes be a daunting task and I can't lie and say it's my favorite thing to do! However, I always love the end result and I'm always so grateful for the memories captured each time. We had so much fun working with Ziem Photography and are in love with the shots she got of our crazy little family! She made it so easy for us by keeping it short and sweet and giving us clear direction. You should know that my littlest, Sophia, was very busy and she was set on trying to chase a puppy in the field...she did not want to stand still or be held! But Ziem and her assistant worked quickly to get some smiles from her and let her continue on her way. Toddlers certainly have minds of their own! Thankfully, Reza and Laila came prepared to show their pearly whites and may or may not have been rewarded with some candy afterwards (I am not above bribing my kids...don't judge!). The end result was priceless photos that we will forever cherish! Click here to enter a super fun giveaway in collaboration with Ziem Photography. 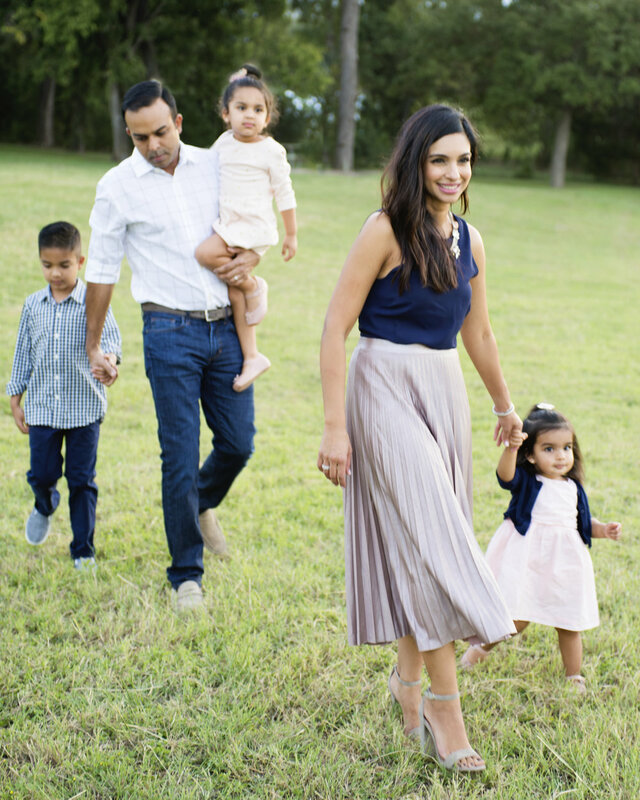 When planning our family's outfits, I started by choosing two colors that I wanted to use- navy and blush. I often tend to use very neutral tones like creams, grays, and blush tones so adding the navy here was new for me but I absolutely loved how it all turned out! Remember when planning your family's outfits to look for coordinating colors instead of matching clothes. The days of everyone wearing white tee shirts and jeans, for example, are long gone! Choosing a couple of colors that you are drawn to will really help guide you in searching for the right pieces for each family member! For shopping details on my outfit visit the Shop page.